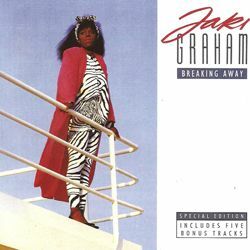 The first CD reissue of this ‘must have’ album by leading British soul singer Jaki Graham. This 17 track CD, features the 12 tracks of the original album plus five bonus tracks. The album peaked at number 25 in the UK album charts in 1986. This collection features five singles including Jaki’s excellent top 20 duet ‘Mated’ with Linx front man and Dance Academy coach, David Grant; the top 10 smash Set Me Free , and top 20 singles Breaking Away and Step Right Up and the lesser known Still In Love . The five bonus tracks featured are Breaking Away (7″ Version), Set Me Free (Extended Version), Breaking Away (Extended Version), Still In Love (Lights Down -Lower Mix) and Luv 2 Much (Too Much 12″ Mix). The CD booklet will include comprehensive sleeve notes and a full UK discography featuring many of her original single sleeves. Jaki Graham has been one of the UK’s leading female soul vocalists since the release of her first solo single What’s The Name Of Your Game in 1984. To date Jaki has scored six UK top 20 singles, and three top 5 singles in the U.S. Dance charts including the monster No.1 Ain’t Nobody. Since then Jaki has released 20+ singles and numerous albums and continues to enjoy the support of a sizeable fan-base.